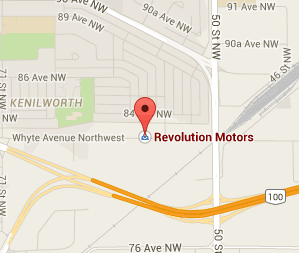 Revolution Motors' has been serving Edmonton and surrounding areas for over a decade. 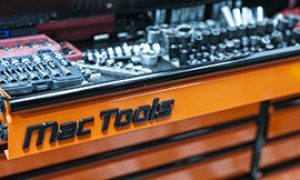 Our experienced mechanics are trained to use the very best tools & equipment to provide the highest quality service possible for your vehicle. Ensuring the safety and reliability of your vehicle is one of our top priorities, which is why we offer a variety of vehicle inspections including commercial vehicle, out of province, and pre-purchase inspections. Contact us today to book yours. Revolution Motors was founded on honesty and sincerity. We confidently stand behind our work and believe in educating our customers about their vehicle maintenance and auto repair requirements. Whether we’re working on your air conditioning, suspension repair, or a squeaky timing belt, our goal is to ensure that you leave our auto repair shop feeling assured and knowledgeable about your vehicle & repairs. 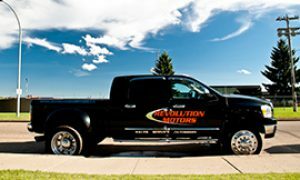 Revolution Motors understands that great auto repair & service means more than just talented mechanics and dependable equipment. 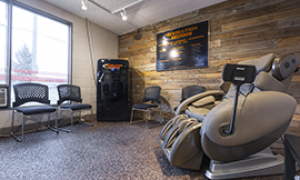 Recharge your battery in our comfortable waiting room (with fresh Keurig coffee and massage chair) while we literally recharge your car battery with our charging system. Enjoy your stay and literally rest easy knowing your vehicle is in great hands. At Revolution Motors diesel vehicle repair is our focus. With state of the art diagnostic tools and equipment, our trained & experienced diesel technicians work hard to be the very best. 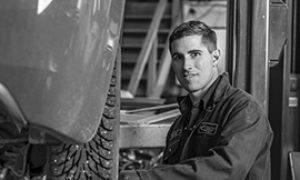 If you’re looking for expert mechanics in Edmonton skilled enough to handle your diesel, we’re up to the task. Give us a call & experience the difference. I took my vehicle in for a standard oil change and Revolution included a inspection with my visit. They found that my battery was failing, and then went above and beyond by contacting the dealership my car was purchased from to check to see if the battery would be replaced under warranty! Thank you for the amazing service Brian & Joel! Revolution Motors is the best auto repair shop in the city! The staff is friendly and knowledgeable, the service is incredible and the prices are extremely fair. The overall experience of going to Revolution Motors is awesome! They have massage chairs, they clean your car and they have excellent rewards programs. I would HIGHLY recommend this business to anyone looking to maintain and/or repair their car! I recently had my brakes replaced at Revolution Motors and I could not be more happy with the service or the work. They were able to see my car right away and were very helpful in explaining the work that needed to be done. I spoke with Derek, Joel & Nelson while my car was at Revolution Motors and all provided the best customer service I have ever experienced at an auto repair shop. I will be returning for all of my car service & repair needs. I've dealt with Revolution Motors a few times now. We purchased a vehicle from Joel and had great success with it. I bring my company vehicles here as well and found the work to be done properly and at a reasonable price. The team here is fast, professional and honest. I run a business myself and in today's world it's sometimes hard to find the honesty and integrity this team has. I definantly recommend Revolution Motors as a smart choice for automotive repairs. :)-Wes-Foam Force Ltd.
Joel and the entire team at Revolution Motors are friendly, knowledgeable and reliable! I recently had my wife's car in for service and it was unlike any other repair experience I've had in Edmonton. They have brand new AWD Subaru's for loaners, a beautiful easily accessible office, a massage chair in the waiting room, free WI-FI and best of all they are honest when it comes to your repairs and the associated costs.